Oh, this rug. In my grand New Years cleaning-the-basement goals (which I've actually been following through on, thank you very much), I unearthed this last week from a pile of forgotten-about linens, blankets and curtains. I put it away two years ago when our sweet Mow, had, well, 'issues' with rugs. It's incredibly old, and just as incredibly shabby. The edges are curled, and it's faded in some spots. 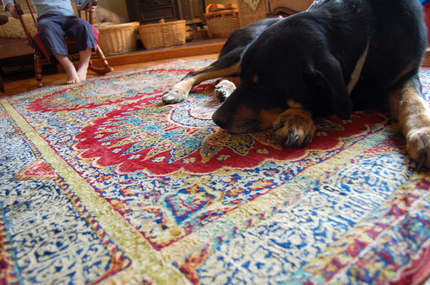 But I love this rug - the colors are so bright and just lovely. It's been in every apartment and house I've had since I've been on my own, since my college dorm room. I found it at an antique mall when I first got to college. I think I was the only one I knew who would rage with the best of them on Friday nights, and still manage to get up bright and early on Saturday morning for, um, yard sales and antiquing. I'd evenly split my precious cash (or, worse, my precious credit) between Friday night tequila shots and Saturday morning vintage quilts. It's a little twisted when I think about it now, but that's how it was. Anyway. That's where this rug came from. I'm happy to have it back to see every day, and apparently, I'm not the only one who's happy about it's return. Do you think Luka is remembering it from her own puppyhood? Perhaps. And Ezra says, "it feels sooooo good on my toes, mama." Yup. It does. I just noticed this post, marking the beginning of Corners of My Home was almost exactly one year ago. The Flickr group is still going strong, with almost 10,000 photos! Wow!